Home > Newsroom > News Releases > Youth Tackle the Game of Flag Football This Fall! Youth Tackle the Game of Flag Football This Fall! CORPUS CHRISTI, TX – Looking for a fun activity that will be a rewarding experience for your child? 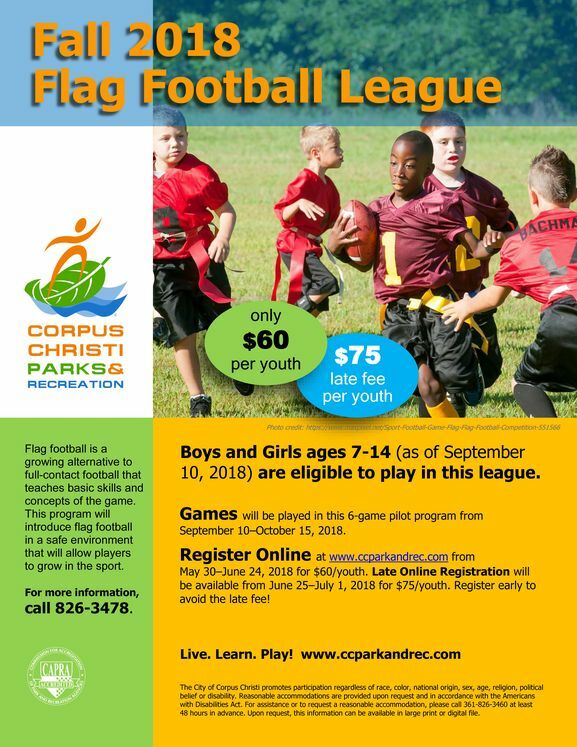 The Corpus Christi Parks & Recreation Department is offering registration for its new Fall 2018 Flag Football League. Girls and boys ages 7 - 14 (as of September 10) are eligible to participate in this league. The six - game season will run from September 10 – October 15. Flag football is a growing alternative to full contact football that teaches basic skills and concepts of the game. This program will introduce flag football in a safe environment that will allow participants to grow in the sport. It will also provide structure and knowledge while promoting a healthy lifestyle that incorporates recreational sports. ONLINE REGISTRATION will be offered now through August 12 at www.ccparkandrec.com (SPORTS). Fee is $60/youth. LATE REGISTRATION will be offered for $75/youth from August 13 – September 2. For more information, please contact the Athletics Office at (361) 826-3478 or (361) 826-3275 . We invite everyone to Live. Learn. Play!